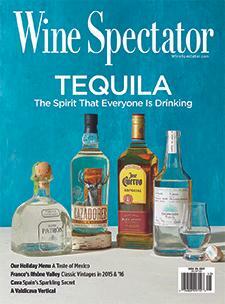 Tequila is no longer just a drink of rowdy parties or of the common man. It has become like a glass of Champagne. It can be ordered as an aperitif in restaurants, consumed with meals or quaffed after dinner. It has found its place on the home bars of wealthy connoisseurs as well as at watering holes frequented by blue-collar workers. Rhône Valley: A free chart offers an alphabetical list of all Loire Valley wines reviewed for the tasting report in this issue. Cava: A free chart offers an alphabetical list of all Loire Valley wines reviewed for the tasting report in this issue. California Merlot: A free chart offers an alphabetical list of all Loire Valley wines reviewed for the tasting report in this issue. FREE: Rhône Valley Alphabetical Listing - More than 925 wines were reviewed for this report. A free alphabetical list is available. WineSpectator.com members can access complete reviews for all the wines tasted using the online Wine Ratings Search. WineSpectator.com: Blogging from the Rhône: This summer, James Molesworth visited nearly 20 Southern Rhône domaines, tasting recent vintages. Get his first-hand accounts. FREE: Cava Alphabetical Listing - More than 115 wines were reviewed for this report. A free alphabetical list is available. WineSpectator.com members can access complete reviews for all the wines tasted using the online Wine Ratings Search. FREE: California Merlot Alphabetical Listing - More than 95 wines were reviewed for this report. A free alphabetical list is available. WineSpectator.com members can access complete reviews for all the wines tasted using the online Wine Ratings Search. WineSpectator.com: Bonus Video: What makes Merlot magic in Napa Valley? Find out from Hourglass winery founder Jeff Smith. TOP 100 COUNTDOWN On Nov. 13, we begin unveiling the Top 10 wines of 2017—with videos, tasting notes and more—culminating with the Wine of the Year on Nov. 17 and the complete Top 100 list on Nov. 20. Don't miss the year's most exciting wines! NEW YORK WINE EXPERIENCE Relive your favorite moments or catch up on what you missed at this year's great lineup of tastings and seminars. Our full coverage of the event, held Oct. 19–21, brings the world's best winemakers and chefs to you with photos, articles and videos. BREAKING NEWS Find out what wine lovers are talking about. From the latest on fires in wine country to lawsuits pitting sports stars against winery owners to challenges that prevent retailers from shipping wine to customers in other states, we've got it covered. James Molesworth's Video Blogs from the Rhône: From plowing stones to managing old vines, Molesworth takes viewers behind the scenes on his summer 2017 visit to the Southern Rhône. Philippe Guigal's La Turque: The E. Guigal winemaker presented his 97-point Côte-Rôtie La Turque 2011 at the 2016 New York Wine Experience. Châteauneuf-du-Pape's Best-Kept Secret: A sliver of the Southern Rhône's Châteauneuf production is white wines. Paul-Vincent Avril of Clos des Papes makes one of the best. TASTING HIGHLIGHTS Get the latest reviews on hot new-release California Cabernets, Chardonnays, Pinot Noirs, Syrahs and more. Every week, we feature Tasting Highlights with the latest noteworthy reviews straight from our editors' tastings, with one edition dedicated entirely to wines from California.